Prime Minister Narendra Modi on Friday claimed that some political factions are using the “the insecurities of Muslims” to collect votes. He made the comment in an interview with ABP News during which he was questioned about the Ayodhya dispute, allegations that he has not done anything for Muslims, about demonetisation and India-Pakistan relations, among other matters. Modi said his government works only in the interests of Indian citizens as a unit. The prime minister stressed that his administration works on the principle of inclusive development. “Some people use the insecurity of Muslims in an attempt to grasp votes,” he added. 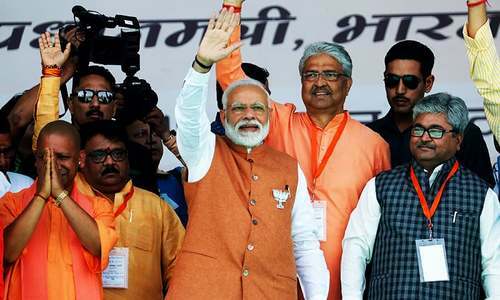 To a question if he wants a temple at the disputed site in Ayodhya, Modi said, “Who wouldn’t....It is not just me, but everyone wants Ram temple to be built.” The prime minister added that they will wait for the Supreme Court to decide on the matter. The Ayodhya-Babri Masjid dispute took a violent turn in December 1992, when Hindutva mobs backed by the Rashtriya Swayamsevak Sangh, the Vishwa Hindu Parishad and the Bharatiya Janata Party tore down the mosque. 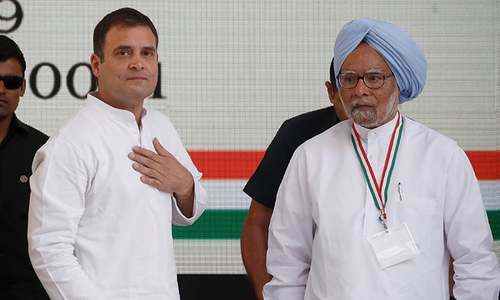 The prime minister also took on the BJP’s rival Congress, saying that its recently released poll manifesto “stinks of separatism”. He claimed the party had taken a shortcut with their manifesto. 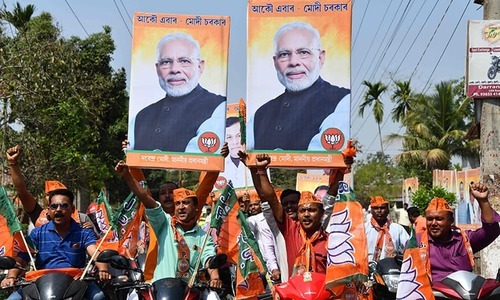 “They want to play around with the Constitution and divide the country,” Modi said, referring to the party’s promise to amend the Armed Forces Special Powers Act (AFSPA) and repeal the sedition law. 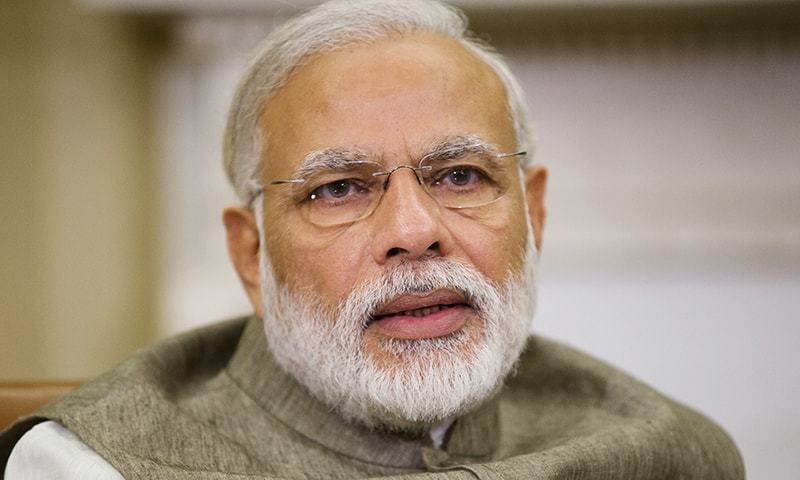 “My administration would also like a situation where such regulation [AFSPA] is not needed, but the status quo is so volatile in so many places,” Modi said. Elections will be held in seven phases from April 11 to May 19. Results will be out on May 23. This article originally appeared at Scroll.in and has been reproduced with permission. This is the fact. Now they will feel the heat. Its time for Modi to pay and others to cash. Elections will tell how well other utilize this opportunity. Muslim women enmass vote for Modi, for reasons everyone knows best! Modi ji is a very humble , honest and hard working Prime Minister of India respected all over the world . His party will surely win up coming elections and will get more than 350 seats . Muslims in India are insecure for good reason Mr Modi. Look what happened in Gujarat under your watch. Their insecurities are justified and real. And UAE announces grant highest civilian award to Modi yesterday. @Zeeshan USA, Read about Godhra train burning. Modi had nothing to do with the Gujarat riots. He happened be a novice CM of the state at that time. There was no single riot thereafter in Gujarat, where he continued to the CM. Those punished by the court are the perpetrators. But Modi bears the heat of the ire, even today. People bow to him for his humble but decisive qualities. just like Trump, Modi will come. Their fears are justified and backed by the memories of events like Gujrat. @Welcome , you are wrong, they won't vote for BJP. Muslims are Muslims whether they are men or women. The last thing India needs is more minority appeasement. No minority groups are safe under Modi-BJP-RSS rule. @brr, "The last thing India needs is more minority appeasement." NaMo will definitely destroy secularism. Good luck! @Zeeshan USA, the reality is the state of Muslims in India is better than that of their Muslim neighbors east or west . If you truly care look at the social indicators , education , woman participation in the workforce , access to health care and per capita income . Now they are still lagging behind Hindus in and other minorities in India but are ahead in the three Muslim blocks . The pecking order unfortunately today within the Muslims of the subcontinent is India , Bangladesh , Pakistan , Afghanistan. We don’t have to attribute this to Modi but the overall reality is a collective reflection. @joe, --- Pakistanis and Arabs are two different species. @Desi Dimag, ... Not according to a Muslim cab driver from India I talked to. He likes Modi, not the Congress Party. Democracy is not about religion in most countries. There is no stopping ....The Modi tsunami is coming. @AXH, and by the memories of the Godhra train, Mumbai, Parliament House, Pathankot, Uri, Pulwama etc. etc. @joe, and Trump continues supplying weapons to the Saudi and Israelis. Irrational, inappropriate behavior is common. Suu Kyi has a Nobel Prize, do what. The butcher of Gujarat gets an award. It means nothing. Though i don't support modi, i think he is not criminal as branded by indian opposition leaders. Modi never hates muslims. He has been honoured by UAE. And only congress leaders and opportunities branded him for their family power gains. I have many Muslim reporting to me at office, they too agree with my views. Please stop such blaming and be good friends. This has always been Modi's line. Development should be inclusive. When development happens it should benefit people irrespective of their caste, creed or religion. The Congress and other opposition parties have mostly appeased Muslims without providing them any privileges. I hope Muslims in India are smart enough to see this and vote Modi. @Zeeshan USA, Check out 10 other administrations ruled by Congress governments. More riots have happened under their watch. BTW, in 2002 Modi was a newcomer and inexperienced. Once he took over there hasn't been a single riot in Gujarat. @Ali Sabir, I agree. I have spoken to many cabbies too. Most of them, irrespective of their religion like Modi. Why are so many Indians commenting and reading Pakistani newspaper? @Shahid Hassan , very objective and realistic analysis. Women empowerment from all religions is Modi's efforts. Neanderthal Modi does not need Muslim votes which account for only 15% of the population when he can get 85% of the non Muslim vote simply by being anti-Muslim. BJP came to power just in retaliation to minority appeasement policies and rampant corruption at the centre. People en mass voted for him because he is dead honest. Earlier Congress used appeasement policies but did nothing to improve the lot of minorities. BJP as such may be a right wing party but the Government does not make make any discrimination in providing jobs or in providing benefits under its social welfare schemes. It is the BJP government in UP which has provided computers in Madarsas and salary for teachers in madarsas. @anil kumar, You are totally wrong. I am from jain community which is 0.5% of population and we feel 100% safe under Modi government. Modi's the man of progress..it is the congress which divides the society on the basis of caste/religion.all minorities are more secure now than nevbefore!! @Welcome , I agree, Congress wanted to encash on this new CM and made him PM. But same mistake Modi also made by making Rahul as leader now.